⇒ Plush Fabrics prevent body temperature from over-heating Parents will appreciate DreamStill and careful attention paid to developing a blanket suitable for maintaining a comfortable full night of sleep as a comforter aid or replacement. ⇒ Positive impacts of Deep Pressure Therapy Used by professionals and occupational therapist to minimize hormonal effects of anxiety and to reduce arousal levels in children as a means to self regulate. ⇒ DreamStill Multi-Purpose Application The therapy blanket designed in different sizes for toddlers, children, adolescents and adults. DreamStill products to be used during interventions to increase body awareness and return the body to a more relaxed state. ⇒ DreamStill committed to continual education and increased awareness for special needs community. Our objective is to provide individuals and children with tools to naturally self heal and techniques for families to promote healthy family functioning. COOL SOFT & COMFORTABLE - This therapy product is designed in the US from all natural breathable fibers such as 100% cotton to achieve calming effects and deeper sleep throughout the night. GENTLE DOWNWARD PUSH GROUNDS BODY - Fine grade poly pellets simulate deep pressure therapy for adults and children to alleviate chronic stress and high levels of anxiety. EXTRA VERSATILE & PORTABLE - Available in 3 different sizes to accommodate weight requirements of toddlers and children with sensory processing difficulties that disrupt sleep patterns. AFFORDABLE & PARENT FRIENDLY - At DreamStill we actively promote autism awareness and realize first hand financial commitments to provide supports for those with special needs. 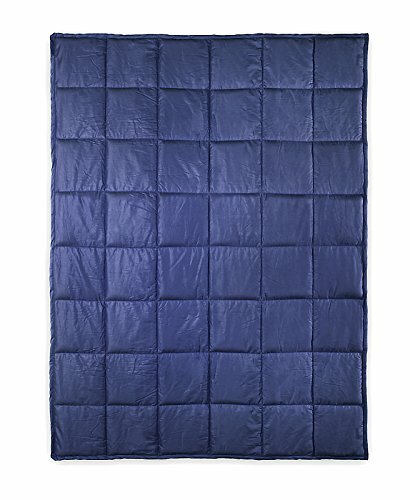 HIGH QUALITY CONSTRUCTION - Quilted from pure cotton and non-toxic poly pellets added inside. Product researched and tested to to ensure proportionate weight distribution. If you have any questions about this product by DreamStill, contact us by completing and submitting the form below. If you are looking for a specif part number, please include it with your message.